Which saying best describes your marriage? My spouse brings out the best in me. My spouse brings out the worst in me. If you’re human, and I bet you are, both have been true from time to time. We have such unreasonable expectations at the beginning of marriage. Perpetual happiness and deep fulfillment, a whole life ahead with a ‘you complete me’ partner. Then we discover, as my husband did one Saturday when I made a sandwich for myself and didn’t make one for him, that said spouse not only can’t read our mind, but they aren’t always thinking of us—sometimes they just think of themselves. That fateful Saturday was 31 years ago. We survived it and lots of other episodes since. 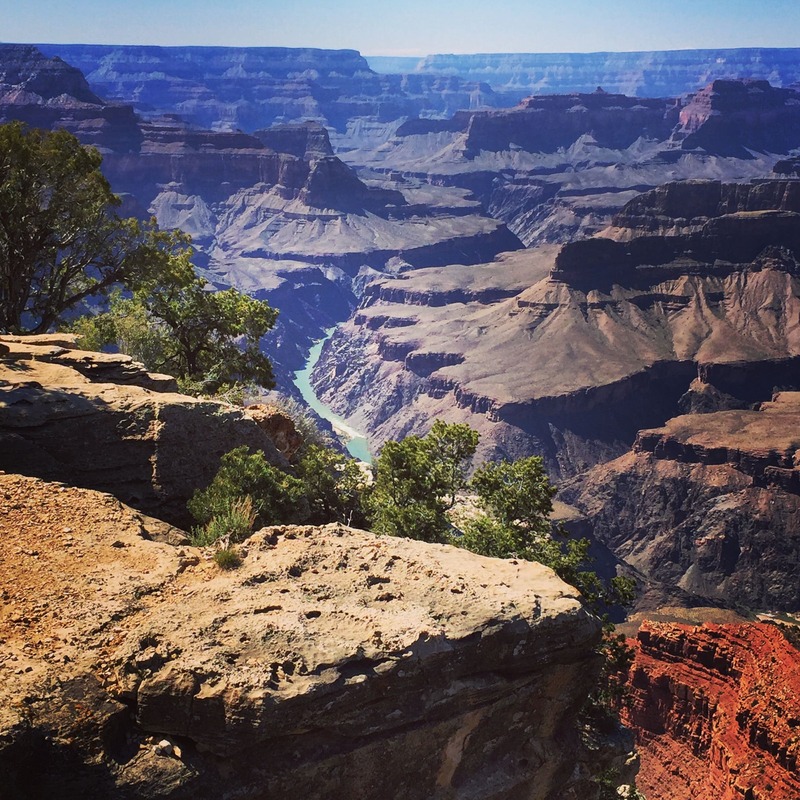 While going through the photos from a recent Anniversary trip to the Grand Canyon, I found myself thinking that the Canyon is a metaphor for marriage. Two forces that act on each other in ways that both alter and define both. Looking at the picture of us with the canyon and the river in the background three truths, lessons in geology and marriage, occurred to me. (1) The Grand Canyon is carved by the Colorado River, but the river is defined by the canyon. There’s a symbiotic relationship between the two. Each one has an influence, an affect on the other. There’s no way to know what one would have been like without the other. Each is, in some measure, a creation of the other. (2) The change is slow. We saw a film from the National Park Service while we were there. Did you know that The Grand Canyon gets deeper each year by about the thickness of a piece of paper? Think of that in terms of your own marriage. Change is incremental, but constant. For good or bad, the way we are with each other has a slow but ongoing influence. (3) In the end, the canyon and the river are each more beautiful because of the other. Aristotle was right; the whole is greater than the sum of its parts. The various deep layers of sediment so vivid in the golden light of sunset are only visible because the river has revealed them. And the river’s course is shaped by the varying density and porosity of the canyon’s geological composition. The canyon wouldn’t be grand without the river. The river would lose its dramatic setting without the canyon walls to serve as a scenic backdrop. I want to have the best possible influence on my husband. I hope he aspires to the same thing where I’m concerned. The potential is there for us each to be better because of the other. I recently taught on grace for a Women’s study. God’s grace came to earth in the person of Jesus Christ. When Jesus is at the heart of a marriage that grace infuses the relationship with love and a desire for God’s best in each other’s life. My husband’s influence has tempered my ‘hot’ reactions. His good humor and steady cheerfulness have had a cooling effect on me. When we traveled in France we stayed in a boutique hotel run by a charming Vietnamese gentleman. When my husband asked if we could get some glasses for wine in our room he replied, “Why Not?” Anything we asked he would smile and say, “Of course, why not?” In a way, that’s my husband’s outlook on life. Genial, optimistic, and ‘why not’. It’s hard to resist that kind of force for good. I think I’ve helped him find the light again when he’s been deeply wounded by others. How would you say you’ve been a good influence on your partner? In what ways have you been ‘changed for the better’ because of your relationship with your spouse? I love the analogies here Kelly. I have hiked down the Grand Canyon, and the canyon just would not be grand without the river. My marriage is still being shaped sometimes by not good choices on my part. For the New Year I would love to bring out the best in my wife. What a lovely and truthful comparison!